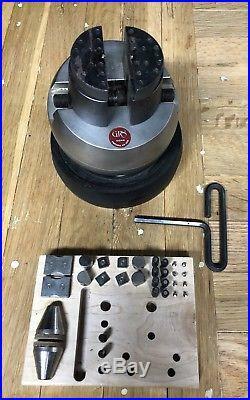 This is a GENUINE GRS Standard Ball Vise used for engraving and jewelry making. It comes with the GRS rubber Vise and a set of GRS holding accessories including coin holder, ring holder and plate holder. It can be used for jewelry repair, model making, stone setting and numerous other projects. 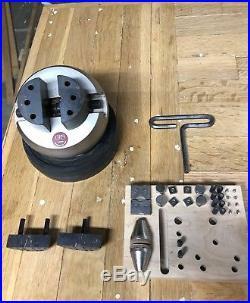 This ball vise was mostly used for jewelry repair. It came from a jewelry store that had closed. The GRS engraving block ball vise is the professionals tool for jewelry repair, stone setting, hand engraving, model making, and more. These versatile clamps are very secure yet easily maneuvered leaving two hands free to work. The self-centering jaws have tooling holes that can accept a multitude of attachments or pins. The vice itself rotates in any direction smoothly on the base/socket. GRS engraving blocks are known throughout the world for their precision mechanics and long life that is an outstanding quality and value. Includes upper jaw plates, 4 pins, base, and wrench. Ball bearing system for smooth rotation. Built in brake allows you to control the directional resistance. Specifically designed black color jaws and satin finish save your eyes from glare or strain. Ball diameter 5.12 inches (130 mm). Jaw width 2.5 inches (64 mm). Jaw height 1.5 inches (38 mm). Maximum Opening 3 inches (76 mm). The item "GRS Engraving Ball Vise With Accessories" is in sale since Saturday, April 28, 2018. This item is in the category "Jewelry & Watches\Jewelry Design & Repair\Jewelry Tools\Engraving Tools". The seller is "n0bnd" and is located in Victoria, Kansas. This item can be shipped to United States, Canada, United Kingdom, Denmark, Romania, Slovakia, Bulgaria, Czech republic, Finland, Hungary, Latvia, Lithuania, Malta, Estonia, Australia, Greece, Portugal, Cyprus, Slovenia, Japan, China, Sweden, South Korea, Indonesia, Taiwan, Thailand, Belgium, France, Hong Kong, Ireland, Netherlands, Poland, Spain, Italy, Germany, Austria, Israel, Mexico, New Zealand, Singapore, Norway, Saudi arabia, Ukraine, United arab emirates, Qatar, Kuwait, Bahrain, Croatia, Malaysia.